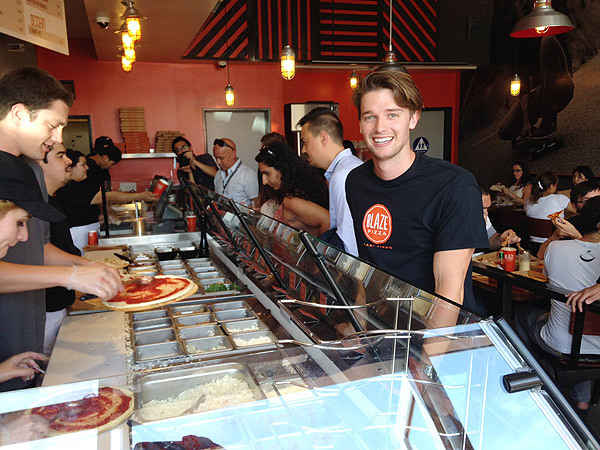 Patrick Schwarzenegger Opens Blaze Pizza Restaurant in L.A.
You may have seen Patrick Schwarzenegger frolicking by the ocean or hanging out recently with his actor turned politician turned actor again dad, Arnold Schwarzenegger, at movie premieres. You may have seen Patrick Schwarzenegger frolicking by the ocean or hanging out recently with his actor-turned- politician-turned-actor again dad, Arnold Schwarzenegger, at movie premieres. But the 20-year-old college student and former model has also been hard at work putting together his latest business venture: a location of build-your-own-pie chain Blaze Pizza. The restaurant, located at The Grove outdoor shopping mall in L.A., had a line three stores down on Thursday, only one day after its grand opening. “Today we have free pizza all day,” Schwarzenegger told PEOPLE, adding that his mom, Maria Shriver, was there helping to make sure everything ran smoothly. Blaze is, essentially, a Chipotle-model for pizzerias: the customer walks down an assembly line choosing everything for a custom-made pizza, from the type of dough — “We have a gluten free option,” Schwarzenegger says — to the type of sauce, cheese, and an array of toppings that include pepperoni, roasted peppers, artichokes, mushroom, olives, chicken, onion and garlic. Once you choose your toppings, the pizza is cooked in three minutes in an 800-degree wood-fired oven. The entire process, from lining up to taking the first bite, takes less than ten minutes. Father Arnold wasn’t able to show up for free pizza day, but his business acumen has been a part of the younger Schwarzenegger’s life since he was a kid.